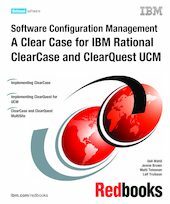 This IBM Redbooks publication describes configuration management in general and how it is implemented in the Rational products ClearCase and ClearQuest. The target audience for this book is anyone considering a software configuration management (SCM) solution, and in particular, project managers and configuration management leaders responsible for medium and large UCM deployments. In Part 1 we introduce the general concept of software configuration management (SCM), and why software asset and lifecycle management is good business. We describe an SCM strategy that leads to the ClearCase and ClearQuest products. In Part 2 we provide the details for planning and implementing SCM using a ClearCase environment, focusing on the test environment, network, servers, and clients. In Part 3 we introduce ClearQuest, its terminology, the roles and responsibilities of the different types of users, and the infrastructure required for a UCM environment. We also provide the details for planning and implementing ClearQuest. In Part 4 we introduce unified change management (UCM) using ClearCase UCM and ClearQuest, including design considerations for an effective UCM implementation, and how UCM is used to manage complexity by raising the level of abstraction. In Part 5 we describe how to do parallel development in multiple geographical locations using ClearCase and ClearQuest MultiSite, including detailed procedures for planning and implementing MultiSite for a UCM environment.